I was snuggled up next to the baseboard heater, just settling in for a morning's surf, when the rainbow materialized. The second rainbow shimmered into view as I jumped up and grabbed the camera. 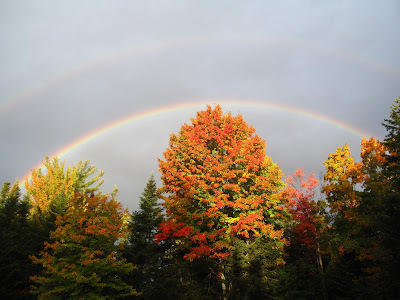 Today's featured photo is the double rainbow Ed, the resident biologist and husband, just received for his first birthday present of the day.